There’s a lot you can do with a bit of potato. It’s quite a versatile food, and you can use it as a cornerstone of many different dishes. It’s inexpensive, and it is available at all times of the year, so you will always be able to get some at your local grocery store. There are also a lot of different kinds of potatoes, allowing for plenty of great variations on standard potato dishes that you can try. It’s easy to modify them and preparing different kinds of potatoes is mostly the same in the end. The white sweet potato is an often overlooked type of potato that can improve some common potato dishes massively, and today we will cover some of the great recipes you can make with it. 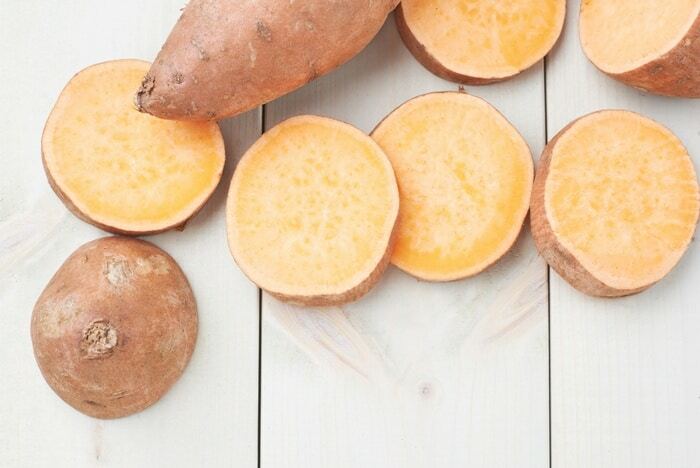 You might not have heard about white sweet potatoes, and that’s not surprising since they are not quite as common as the other types of sweet potatoes. As you might know, sweet potatoes can come in a wide variety of different skin colors – yellow, red, brown, and so on. Different flesh colors like white, orange, yellow and even purple are also out there. However, the most common type of sweet potato is the one with copper-colored skin and soft orange flesh. The other main type comes with golden skin and white flesh, which is the one we will cover today. The white sweet potatoes are less sweet than the orange variant, making them well-suited for dishes that require a bit less flavor from their ingredients. They can also be used with a wider variety of spices since their natural flavor won’t overpower the spices used in the dish. They can add that little bit of sweetness and texture without dominating the dish, which is something you can’t do with orange sweet potatoes. Don’t confuse sweet potatoes with yams though, that’s a completely different story. 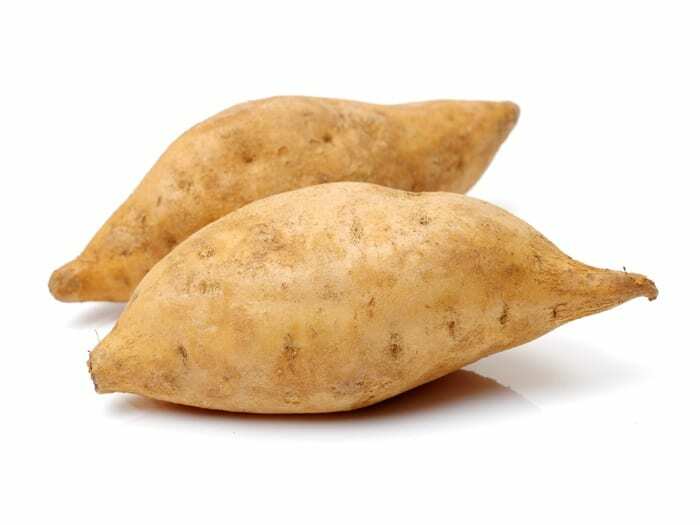 Orange sweet potatoes tend to be labeled as yams as a way to distinguish them from the white sweet potatoes. However, yams are a completely different sort of vegetable, and you shouldn’t mistake them for sweet potatoes. In general, sweet potatoes of all kinds are healthier than regular potatoes, even though both are good in moderation. There are a lot of reasons why sweet potatoes come out above regular potatoes as the healthier food item. First is the fact that they contain more antioxidants which are beneficial for people with high blood pressure. The other one is that, despite what their sweetness may lead you to think, they actually contain fewer carbs than regular potatoes, on average. They also contain a lot more vitamin A and vitamin C, which are both essential for a healthy balanced diet. There’s more, but going into every detail might be a little too much for this article. When it comes to nutrition, white sweet potatoes aren’t much different than orange sweet potatoes. They contain slightly fewer antioxidants, but that’s about it. The main difference is in the taste, rather than in the nutrition. Some people will tell you to take off the sweet potato skin when baking or cooking them, but others will swear by it and say that taking the skin off is a bad thing to do. So, what’s the deal? Well, we looked into it and here’s some info we came across. Overall, the skin of a sweet potato is extremely beneficial and contains plenty f useful nutrients that you shouldn’t pass up on. It’s rich in Vitamin C, Vitamin E, and Beta-Carotene, which are all essential to a healthy and balanced diet. If you take off the skin, you make the sweet potato a lot less nutritionally beneficial for yourself. Of course, you should wash the potatoes thoroughly before eating them, since a lot of dirt can be gathered up in the skin. This is where the myth of the potato skin being inedible or bad for you, comes from – badly washed potatoes that made people sick. It was not the fault of the skin but rather the people preparing the meals that used it – don’t make the same mistake. 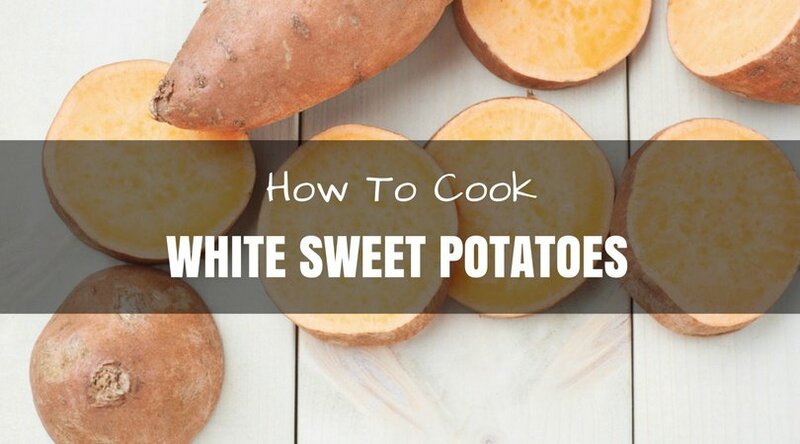 Let’s get right down to it and go through some of the best white sweet potato recipes we know of. Most of them are relatively easy to make, and you should be able to find all the ingredients at your local grocery store. You will be able to cook up some of them in no time at all. So, let’s begin with one of our favorites. 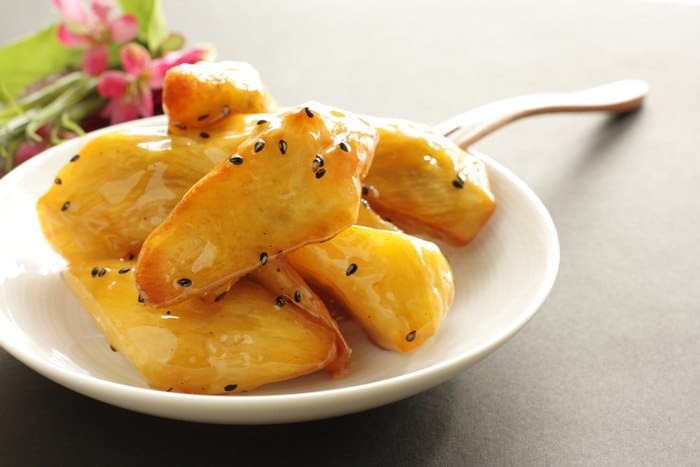 This is a great sweet side dish that can be served with a wide variety of main dishes, like pork chops or a roasted turkey. It can also be served as an appetizer or even as a dessert if you don’t want something too sweet and carb-heavy. It’s quite a versatile dish. You’ll need the following ingredients: 2 pounds of white sweet potatoes, half a cup of mirin or some other sweet wine, 2 tablespoons of honey, 1 tablespoon of distilled white vinegar, half a tablespoon of salt, 2 teaspoons of corn oil or some equivalent substitute, 2 tablespoons of butter and some sea salt, which is optional. Making this dish might seem complicated at first glance, but it’s not. First, you should put a cast-iron skillet in the oven to preheat it. The oven should be at around 450 degrees. You start out by microwaving the potatoes on high for around 5 minutes. After that, you wisk the honey, vinegar, and mirin with salt in a small to a medium-sized bowl. Now peel the potatoes and cut them into round slices, preferably not more than 1-inch thick, then add them to the mixture you made and leave it to coat. Now, take out the skillet and add oil onto it before tossing the potatoes, cut side down, onto it. Bake them for around fifteen to twenty minutes, until they caramelize, then turn them over and cook them for five to ten more minutes, until they are tender. After that, transfer them to a platter and scrape the brown parts off. Add some melted butter, sauce and salt to them for seasoning, and it is done! You can also experiment with other spices when making this dish, and some of us have found that we like it lot with some wasabi. Try it out and see how you feel about it. You can whip this pie up in almost no time at all, and it will be a great fit for almost any dinner table. It can be served standalone or as a nice and healthy dessert. 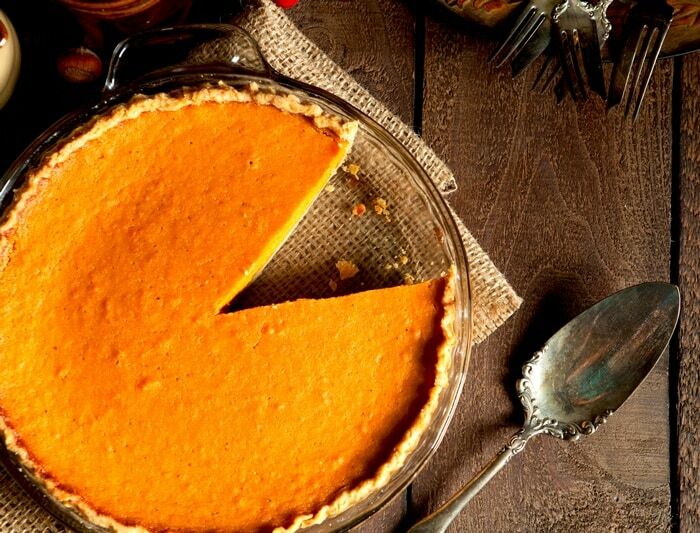 The necessary ingredients are as follows: 1 stick of butter or margarine, 2 cups of sugar or stevia, 2 eggs, 2 tablespoons of flour, 1 cup of mashed white sweet potatoes, 3 tablespoons of vanilla and a pie crust. Start out by boiling the potatoes until they are soft, draining the water they were boiled in, then adding a bit of milk and mashing them. After that, melt the stick of butter in a pan, add the sugar and eggs to it, then mix it all until it becomes creamy. Follow that up by adding the flour and the mashed potatoes to the mix before pouring it all into a premade pie crust. Bake the pie at 300 or 350 degrees until it becomes firm and takes on a golden brown color. Take it out and serve it while still hot for the best results! Here we have a nice and savory dish that can be served as a good appetizer or just a light and tasty snack that doesn’t contain a lot of carbs or fat. You can also replace some of the seasonings here with different ingredients and experiment until you get the recipe down to how you like it. 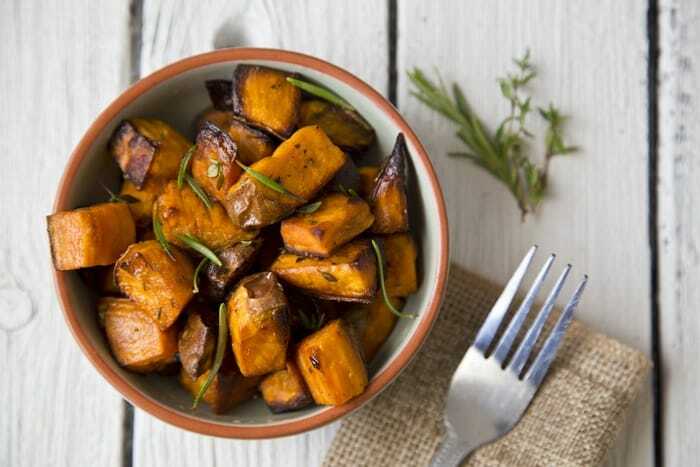 To get started you will need these ingredients: 4 medium-sized white sweet potatoes, 3 medium-sized red onions, 3 tablespoons of olive oil, 2 tablespoons of chopped rosemary(fresh, not dried), 1 tablespoon of sea salt and 1 cup of grated parmesan. Begin by cutting the potatoes into one-inch pieces (peel them before cutting, if you want) and chopping the red onions into slightly smaller pieces. Put in the oil and toss it around before adding one tablespoon of chopped rosemary, preferably fresh, and spread it all out on a roasting pan. Roast it all at around 400 degrees for around thirty to forty minutes. After that add in the second tablespoon of chopped rosemary as well as the grated parmesan and salt, then toss it all and serve! You can also experiment with adding a few more different spices or replacing rosemary with a different seasoning. We like adding some black pepper to the recipe for extra spice! Those are the best recipes for white sweet potatoes that we could find, and they are all relatively straightforward and easy to make. You should try them out and see for yourself! Once you get the hang of them, you can also modify them to your liking with ease.